How safe is our food? Not safe enough, says PIRG Consumer Watchdog team, and it's trending in the wrong direction. Going to the grocery store shouldn’t feel like a game of chance — where anything we buy has the potential to make us sick. That’s why we have processes and systems in place at the federal level to protect us from food contamination. 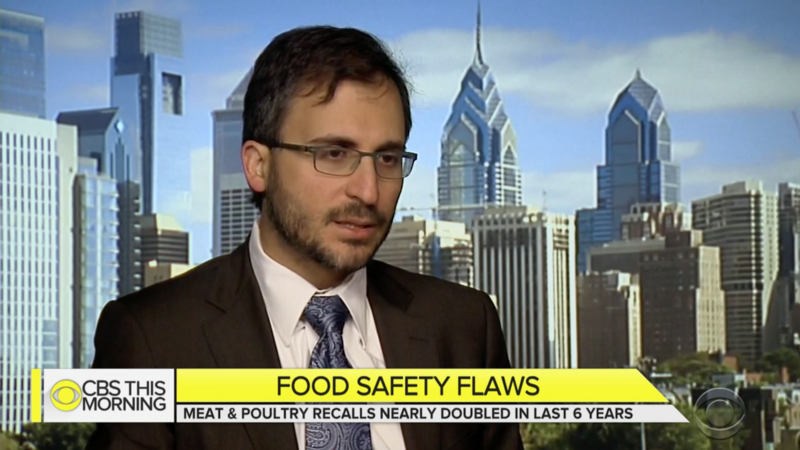 But according to a new report by U.S. PIRG Education Fund, unsafe food recalls are now on the rise: Between 2013 and 2017, recalls increased by 10 percent overall, and by a whopping 83 percent for the most hazardous meat and poultry recalls. These were the chief findings of the report released in January, titled “How Safe Is Our Food? ", which reached millions of people through coverage on CBS This Morning, TIME Magazine, NBC News and USA Today. Americans rely on a vast network of farms and businesses to provide safe food daily. And this system is significantly better than it was 100 years ago, when toxins and bacteria were regularly contaminating food. But in recent years, a string of high-profile recalls of everyday foods — ranging from romaine lettuce to millions of pounds of beef to Ritz and Goldfish crackers — have called our systems into question. And the Centers for Disease Control and Prevention estimate that 1 in 6 people in the U.S. contracts a foodborne illnesses each year, and shockingly, 3,000 people die annually from eating contaminated food. “Americans really should be confident that our food is safe and uncontaminated from dangerous bacteria like E. coli and salmonella,” said U.S. PIRG Consumer Watchdog Adam Garber to TIME Magazine. Certainly, in an age when gourmet, ready-to-cook meals are delivered to people’s doorsteps every month, we have the technology and ability to ensure that the meals we eat won’t make us sick. U.S. PIRG Education Fund’s findings make it clear that our country’s food safety defenses need an across-the-board upgrade. Gaps in public health protections, enforcement and inspection make it too likely that dangers will reach Americans’ plates with potentially disastrous consequences. And, when these dangers are identified, our recall system often allows hazards to continue to impact people’s health. “These recalls are a warning to everyone that something is rotten in our fields and slaughterhouses. Government agencies need to make sure that the food that reaches people’s mouths won’t make them sick,” Garber told NBC News. Can we make a better system? The PIRG Consumer watchdog team knows we can, and has a plan for a better way forward. Most of these recalls and many food-related illnesses can be prevented through simple, commonsense actions that would block the contamination from happening in the first place — such as public health standards for agricultural water, a ban on salmonella in meat, and a better recall system to get dangerous food out of people's homes. When dangerous food is discovered, stores should stop selling it, and people should be alerted early and given clear guidance on how to identify any contaminated food in their homes. By shining a light on the problem, and putting the PIRG Consumer Watchdog team on the case, we can make clear the need for a new system, and set us on a path to making concrete changes for a healthier and safer future when it comes to the food we eat and feed our families. You can read U.S. PIRG Education Fund’s full report here.